Cannot specify multiple case labels on a single line without repeating multiple “case” keywords. Unable to express a case label with pattern/range matching criteria. Must define an exact match . Manually manage fall-through with repetitive break statements for each case and must be careful against accidental fall-through. No support from compiler to ensure your covering all the cases (known as exhaustiveness). No real local scoping in each switch arm. I have a friend who started learning Java this year and he intuitively tried using the switch statement with range checking an integer i.e (case < 100). He was disappointed when told by the instructor that this wasn’t supported. We had a discussion about it afterwards and it got me thinking about actually writing this post. The point is that even a novice programmer is expecting more from Java’s switch …time for improvement! 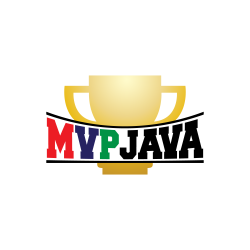 The code for this tutorial is available on MVP Java’s GitHub account here. 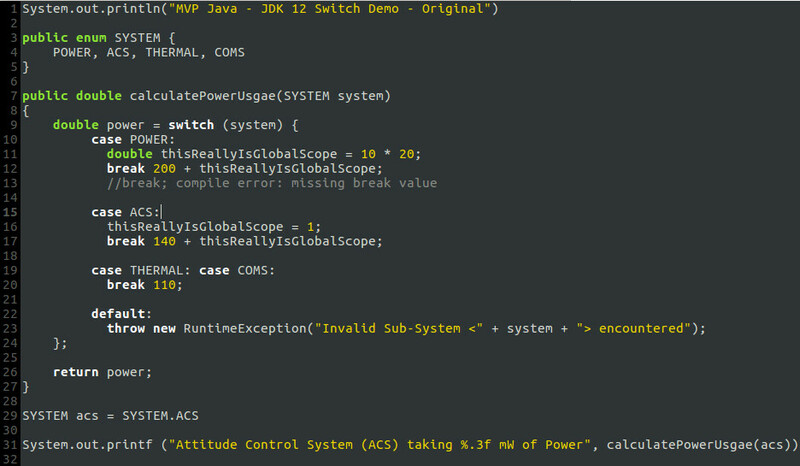 I’ll be demonstrating the new JDK 12 switch preview feature via JShell . This has all been setup for you to run within an official Docker container with access to all the JShell *.jsh script files for you to play around with. The environment is totally reproducible with a single git clone command followed by running a Docker container via the “run.sh” script provided. Notice on line 13 that the variable “thisReallyIsGlobalScope” may look like it has local scope however it doesn’t. As you can see on line 18, we can reference it because the variable scope is the entire switch statement — all cases including default. Although you can re-use the variable name on line 18, you can’t reference its original declared value from line 13 (i.e: thisReallyIsGlobalScope++ will not result in 201) since the compiler will complain that it may not have been initialized … and it’s correct. Even if you leave out the break on line 15 to cause an intentional fall-through, this doesn’t help. BUT notice we forgot the break; statement thus causing an accidental fall-through … it happens more than you think. Aren’t you tired of formatting your code on a single line just to save space to include multiple labels such as “case THERMAL: case COMS:” – see line 22. Why do we have to repeat the “case” keyword every time? We shouldn’t have to define a default: switch arm for an enum if you think about it. There are a finite amount of possibilities listed in an enum therefore should’t we have some sort of built in support to take care of this case for us? 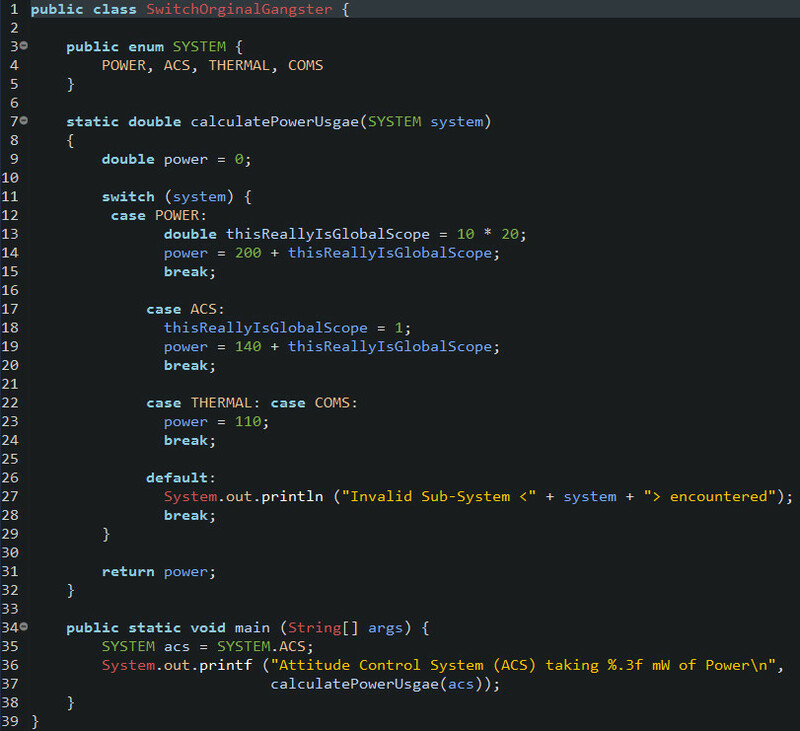 Nothing worse than writing code that in theory will never be called. In the end we are decorating the above switch statement to behave more like a switch expression. It is wrapped in a method in which all the switch arms assign a value to a variable and then return it. This switch statement versus expression decoration makes me think of the similar difference between a regular if statement and Java’s ternary operator. The difference being we don’t have to wrap the ternary operator in a method because it functions as an expression as is. Although many improvements have been made to Java’s switch statement, this is not set in stone. 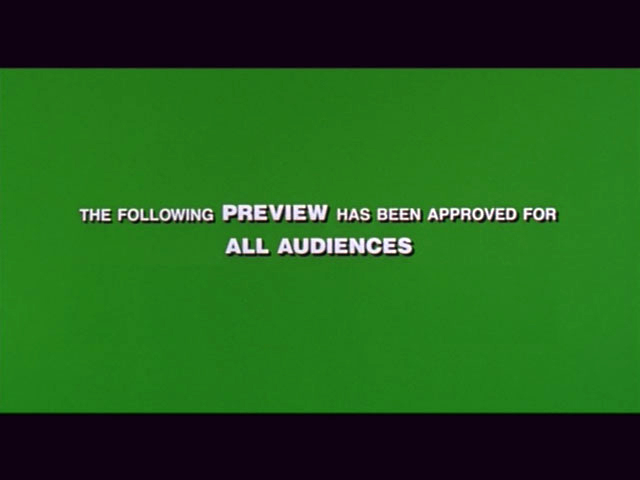 JDK 12 is introducing it as a preview feature which must be explicitly set in order to be enabled (as shown below). Preview features are treated as experimental before being made officially part of any future JDK release – developer feedback is welcome here at the Amber mailing list. Unfortunately case labels supporting pattern/range matching (JEP 305) are not yet available in JDK 12 but we should see them in JDK 13 – that is great news and I can’t wait for that. 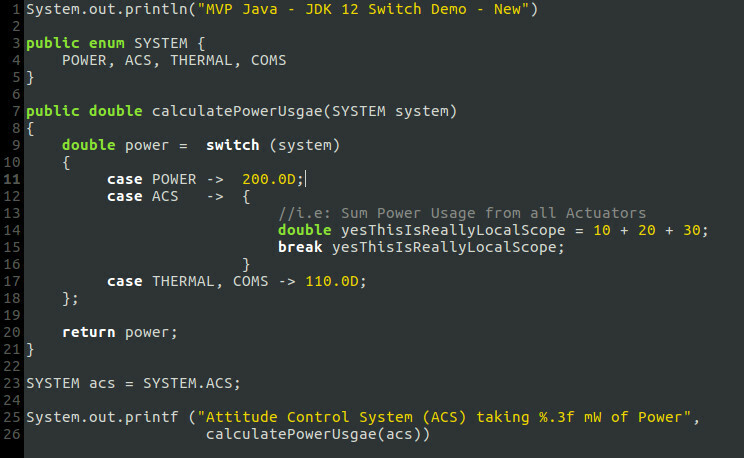 JDK 12 Switch – What’s new? The JDK 12 switch statement has really been improved upon by reducing its verbosity while addressing the fall though, scoping and exhaustiveness issues with enums. Lets visit each improvement separately . You now have the choice to re-write a switch statement as a switch expression! Switch expressions are supported in both the new and traditional switch statement syntax. Lets see an example below using the following JShell command with the contents of the JShell script file. A Lot has changed in the above new JDK 12 switch example but you can see that on Line 9: The switch result is being assigned to a variable, thus being used as an expression. Consequently, you must include the semi-colon on line 18!. Stating the obvious … less verbose! The following improvements were made. Line 17 now lists multiple switch labels separated by a comma. No need to repeat the “case” keyword anymore. No default case needed for enum types – exhaustiveness. The compiler inserts the default case for you and provides the following compilation error “the switch expression does not cover all possible input values“. The “break” statement can and must specify a return value when the switch is used as an expression. It’s easy to think that you need to use the “return” keyword instead but that is actually wrong. You can’t use “return” anymore in a block to the right of the the new arrow syntax or if a traditional switch is used as an expression. The new switch syntax resembles the lambda syntax since its leveraging the arrow symbol “->”. Each switch label can be written with the new “case $L ->” syntax which has the benefit of stating that only the block to the right of the arrow is executed (that’s really why we don’t need the break anymore). Basically, something must be returned in one of the above forms. Goodbye globally scoped variables in “case $L -> ” based switches. Variables declared in a switch arm now only have local scope meaning no other arm can access it. If you want to use the same variable name, that’s not a problem – just declare your own copy in the switch arm. Line 14 show cases a real local variable that cannot be referenced in another switch arm. You can still opt to use the old switch syntax even as an expression if you want, both forms are acceptable. However using the old syntax as a statement will re-invite the above pain points we discussed at the start of the post. Just remember that you must use break with a return value now (Line 12, 17, 20) since the break statement has been enhanced to return a value. The JDK 12 switch has had some substantial improvements made ranging from reducing verbosity to being used as an expression. Although still due for further improvements such as pattern matching and extending exhaustiveness to cover sealed types, I hope to see it part of JDK 13. Don’t forget to check out the YouTube version of this tutorial here. If you interested in developing Spring Boot Applications in a Docker Container then check this great Post I wrote Running Spring Tool Suite 4 in Docker.